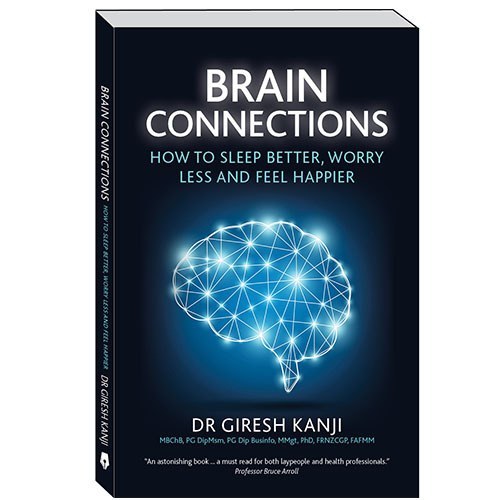 Learn why you develop insomnia, anxiety and depression. Discover why these three conditions occur together and how to alleviate them without reaching for pills. Fibromyalgia is also explained in this book. This book is full colour gloss and easy to read. Dr Kanji is a Musculoskeletal Pain Specialist and Researcher who has spent more than two decades at university obtaining a variety of degrees and admission to two professional faculties. His PhD explored pain and the stress response. He is the chairperson of the NZ Pain Foundation and editor of Australasian Musculoskeletal Medicine Journal. He is currently conducting a randomised control trial on low back pain and next year will start a randomised control trial on depression. Free postage on books sent parcel post within New Zealand. For Fast Post we charge at cost. For Courier Post we charge at cost. All orders are shipped first-class airmail and should arrive in three to ten days. Our prices are highly competitive. Postage is charged at only 50% of cost. If the book becomes damaged in transit please email info@fixyourstress.com and a new book will be sent out. © GireshKanji 2019. All rights reserved.